Swimming:Stroke Fundamentals, Improved efficiency, Open water strategies, improve competitive edge. Triathlon: Fundamentals, Advanced training sessions-beginners to elite, Race pacing strategy, Mental preparation, Improve competitive edge (swim smooth, bike strong, run fast). Single-sport and multisport training plans Sprint to Ironman @ $75 to $200 per month. One-on-one sport specific coaching @ $45 per hr or pkg deals. 1/2 day group swim clinics (pool or open water) $75. Prepare ATP $50. 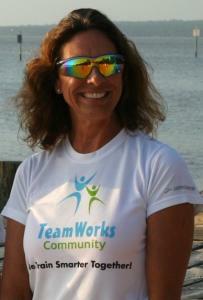 Full Time USA Triathlon Level 1 Coach, Michelle lives in Fairhope, AL. Trains along the Eastern Shore of Mobile Bay between Mobile, AL and Pensacola, FL. Michelle, currently coaches about 20 triathletes, on a customized training program. Additionally she coaches about a dozen athletes one-on-one in swimming, biking, running bio-mechanics. President of the TeamWork Tortugaman Club- home of the TORTUGAMAN CHALLENGE 277.7. Also a certified USMS Master's Swim Coach with Eastern Shore Masters Swimming, Michelle specializes in swim technique instruction in the pool and open water. Formerly, an AAU and NCAA award winning swimmer and age group coach, Michelle has a passion for optimizing your swimming technique & fitness in Triathlon. As an age group triathlete since 2001, and an Ironman finisher, Michelle has consistenly finished on the podium or in top 10% of her division in all her triathlon competitions. She is eager to work with single or multisport athletes at any age or fitness level. Must be able to swim at least 50yds non-stop, bike @ 13mph nonstop for min. of 10mi, run 1 mile non-stop in under 14minutes. Success. Coach Michelle Smith has been notified of your message.